on dot-gov: What Is Gov Tweeting About? Twitter is a social networking and microblogging tool that lets people send short--only 140 characters--text messages to friends and on a massive public timeline. It is growing fast, 131% traffic increase in March to over 9 million visitors. It has grown because it is easy and conversational. People can learn about friends and even converse with celebrities. See what Shaquille O'Neal has to say at twitter.com/the_real_shaq. See also twitter.com/nasa for an example of what a government Twitter stream looks like. Nextgov looked at a random sample of 100 Twitter updates from ten different government organizations to find out what federal agencies were tweeting about. They generated lists of the 40 most-used words in each organization's Twitter feed. It's very interesting to see the words that agencies use in their tweets. The larger the word, the more frequently it is used by the agency. See all ten agency results here. Twitter can be a broadcast channel, but many see Twitter as a tool to engage and converse with followers. In the case of government, followers are citizens, constituents, and other stakeholders. 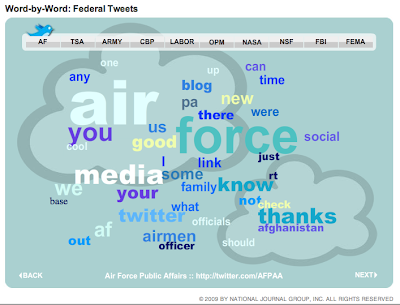 In the Air Force example, they most frequently talk about themselves: air force, af, airmen and officer, official; they also talk about the media. Another big word, however, is THANKS, definitely a term of engagement. The second example is from the Transportation Security Administration (TSA). Their Twitter stream is all about their blog, post, blogger, publish, less about the organization, tsa and dhs. One of the biggest word on the page, though, is YOU and your. Looks like the agency is getting outside of itself. What would your agency tweet about? Nice post, Gwynne. 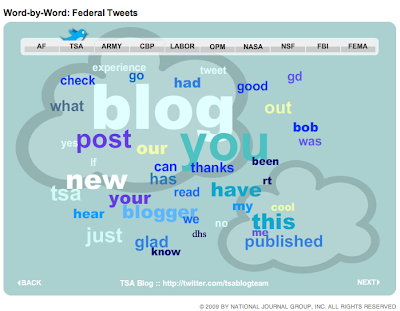 I saw this article in NextGov as well and liked the tag clouds as a way of showing what's on an agency's mind.